The summer is a critical time of set back or increases academically. Quality summer learning opportunities are essential to prevent summer slide and help students to be prepared for the start of each new academic year. This video explains how summer learning slide affects students. Part of the State Department of Education’s 8-year-plan is a strong focus on leveraging out of school time to better address student needs. Continuous learning through the summer is one way to emphasize learning for the long run. Check out this article to see what Macomb, Oklahoma's 21st Century Community Learning Center is doing with summer learning! As soon as one summer ends, it's time to start planning for the next one! 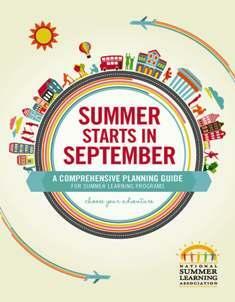 The new Summer Starts in September: Comprehensive Planning Guide for Summer Learning Programs includes 200 pages of research-based strategies, program examples, and tools that summer program staff, leaders, and trainers can use to develop an intentional, high-impact program. The guide is brought to life by 80 summer learning quality indicators, developed and tested through years of partnership with summer learning programs, researchers, and trainers. Together, these indicators make up the National Summer Learning Association's Comprehensive Assessment of Summer Programs (CASP). Check out Learning Heroes' Summer Stride easy 3-step plan plus other ways to support summer learning fun!